Alternate history, particularly in its Victorian 'steampunk' form, is a sub-genre of SF I favour only slightly ahead of post-apocalyptic settings. Contributing genre-defining novels to the canon is nothing new to either of the co-authors of 'The Difference Engine', with both Gibson and Sterling having shaped our understanding of 'cyberpunk'. With authors of such pedigree, and a theme that would seem to be tailor-made to please me, why did I find The Difference Engine so unsatisfying? It was not the authors' playful inversion of Victorian political mores. I very much enjoyed learning about the ramifications of the Time of Troubles within the work, the dissolution of 'the declining and decadent Tory blue-bloods, a class destined to be swept from power by the rising middle class and the savant meritocrats,' heralding 'the revolutionary tenor of the coming age of industry and science', sliding through 'strikes, manifestos and demonstration, to riots, martial law, massacres, open class warfare, and near total anarchy. Only the Industrial Radical Party, with their boldly rational vision of a comprehensive new order, had saved England from the abyss (pp. 140-41). It did not reside within the language. Gibson and Sterling do a creditable job of daubing the text with splashes of cross-class Victorian patois. The strenuous efforts the authors go to in order to demonstrate their mastery of language in its re-imagined historic context are pleasurable, and plausible to both eye and ear in a way that, for example, Tim Powers' deployment of contemporary idioms within the sixteenth century Venetian setting of The Drawing of the Dark just are not, to the work's great detriment. It was certainly not the unique steampunk flavour that the authors succeeded in imbuing the work with. The Difference Engine's steam gurneys, autocafés, National Credit plates, and nested loops of subversive code contained within the camphorated cellulose punch-card of the Modus Programme introduced into the Grand Napoleon engine, among other things, were all highly entertaining. For me, the failings of The Difference Engine reside chiefly within its plotting. Structurally, I take no issue with the authors' roaming authorial eyes having fallen upon different characters to lead the reader through the narrative, disappearing and reappearing in turn, either in person or as ciphers. Rather, it is the novel's philosophical pay-off in the final section wherein the reader is hurriedly compelled to consider the work as a parable of the role of the 'clacking' (hacking) of derivatives of Babbage's Analytical Engine for the purposes of political intrigue and the deleterious effect the consequent development of machine intelligence has on the fate of humanity ('human faces that are borrowed masks, and lenses for a peering Eye', (p. 382)) that is so unsatisfactory. 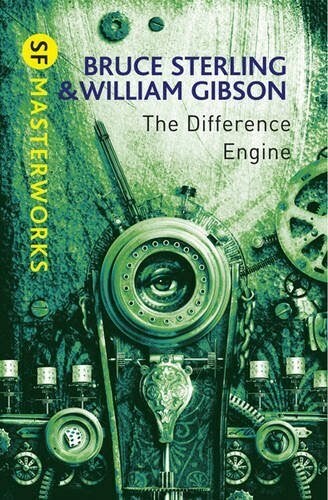 Whilst the 75 pages that advance the plot of this intriguing SF Masterwork at the beginning and end of the novel would have made a gripping short story, the intervening 300 pages serve more as a broadly independent thriller with steampunk tendencies than they do as part of a larger, integrated whole. With the baton-changing protagonists having been pursuing Captain Swing throughout the pages of the work, the confrontation between Edward Mallory, his brothers, the secret policeman Ebenezer Fraser and the elusive agitator himself is particularly disappointing. 'Is it not strange that we mere mortals can talk about a subject – truth – that is infinitely complicated? And yet - is not a closed system the essence of the mechanical, the unthinking? And is not an open system the very definition of the organic, of life and thought? If we envision the entire System of Mathematics as a great Engine for providing theorems, then we must say, through the agency of the Modus, that such an engine lives, and could indeed prove its own life, should it develop the capacity to look upon itself The Lens for such a self-examination is of a nature not yet known to us; yet we know that it exists, for we ourselves possess it' (pp. 376-77). Seems like a book I would probably leave in storage honestly. Although not a very long book, it looks like a lot of themes and plot is being squeezed into the space. I'd probably get lost reading halfway!